Rich Mason -- 1964 Cobra 427 Prototype "Flip-top"
This car was Carroll Shelby's answer to the Corvette Grand Sport. 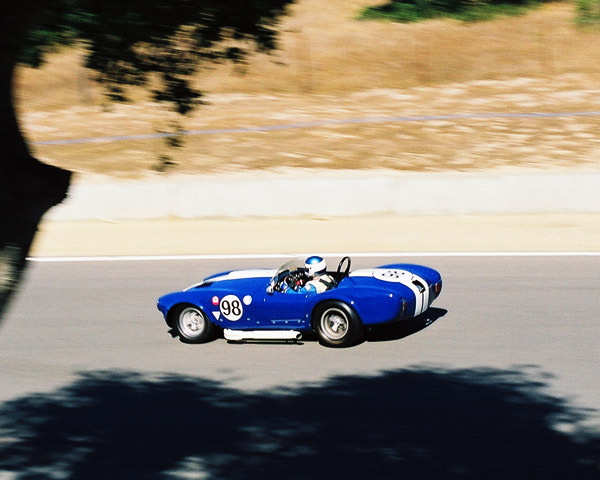 The lightweight Stingrays were more than a match for the 289 Cobras at major events in 1963 and 1964. Rich Mason in the corkscrew. The car is known as the "Flip-top" Cobra because the whole front end lifts up race-car style, rather than the standard hood used on production Cobras. Shelby and Test Driver Ken Miles built this beast with an aluminum 390 cid engine. It was raced by Miles at Nassau in 1964 and later became the test mule for the later 427 Cobra production cars. Back to: Monterey Historics 2000 -- Homepage.